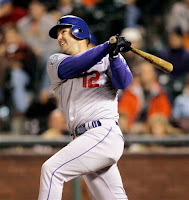 Former Met, Indian, Giant, Astro, and Dodger second baseman, Jeff Kent, retired this past week. The 40-year old infielder finished his career with a batting average slightly under .300 and 377 career home runs. Kent is widely considered as "the most powerful second baseman ever," which in my mind, doesn't mean all that much. All of this still doesn't punch a ticket to Cooperstown in my humble, or not so humble, opinion. For starters, the bulk of Kent's career was played in the National League, over the past ten seasons the National League has been the inferior league when it comes to pitching. Remember those years when the NBA's New Jersey Nets were the best team in the Eastern Conference, and then they'd get throttled in the Finals by the Spurs and Lakers, well I consider Jeff Kent to be the Nets. You won't remember him in ten years, and if you hear the name you'd think he sold insurance. Secondly, I'm not going to ignore the fact that the prime of his career, 1997-2002, was spent hitting in front of Barry Lamar Bonds. The same Barry Bonds who clubbed a million home runs and walked just as much. If your going to hold power hitters of that era, the steroid era, to the same dirty standard, then you have to include Kent. Jeff Kent hit 30 homers or more in three seperate seasons, all coming while he was on the Giants, and none coming before or after he played with the Giants. He played in 150 or more games only 4 years of his 16 year career, all with the Giants. None before or after he left the city by the bay. Two things we know about steroid users, they stay healthy, and they club the pill over the wall. I'm not saying Kent was a steroid user, I'm just putting the question out there, the same way you do with McGwire, Sosa, and Bonds. Compare the career of Jeff Kent, who got major pub playing next to Bonds, to former Mariner, Brave, Padre, and Twin second baseman, Bret Boone. Bret's best years were between 2001-2004, he played in 158, 155, 159, and 148 games each of the four seasons. Those years he banged out 30+ homer seasons twice, never in his previous 9 seasons had he gone over 24. Sound familiar? Boone never committed more than 15 errors in a single season of his fourteen years. Kent committed between 16 and 21 errors SEVEN times in his career. I haven't even mentioned how Jeff Kent was hated by every teammate he ever had, and got in multiple altercations during his time in San Francisco and Los Angeles. You don't consider Bret Boone a Hall of Famer, no one does, then you can't put Jeff Kent in the hall either. KEEP IT REAL! Really?!?!?! Allen Iverson was the guy all of us fans wanted to start the All-Star Game. Really!?!?! Love Iverson, but is he the guy who you really want to see in the ASG? Celtics guard, Rajon Rondo, is averaging 10 points, 8 assists, and 5 rebounds a night. Nets guard, Devin Harris, is averaging 22 points and 6 assists, every night. Both guards would be more interesting to watch than, going through another All-Star game with Iverson running the point. Sure, Iverson fills the "star" power roll, very nicely I might add, but these games are for basketball fans, not casual viewers. No slight to Iverson, but I'd much rather see Harris or Rondo running the show with Dwight Howard, LeBron, KG, and Dwayne Wade. Keep It Real, stop voting in the perennial favorite. Oh you were just about to write off the defending champion, Boston Celtics, weren't you? Losing 7 of 9, looking real soft, does that to your confidence. But were you really calling the Orlando Magic the #2 seed? Torching the Suns to the tune of a 21-point victory. Beating the Heat by 15 on the road, and then following up that with a ten point win over the Magic at their place. The Celtics are 36-9 closing in on the All-Star break, they are still on that crash course with the Cavs for the Eastern Conference Title, and WOULD YOU PLEASE, stop overreacting every time they drop a game? February 5th they get their revenge against the Lakers at Boston, Cleveland returns to the TD Banknorth Garden a month later, by the time St. Patrick's day rolls around the Celtics will have added a big-man to come off the bench. BANK ON THAT! Keep It Real! . . . . . . It's Obamamania!